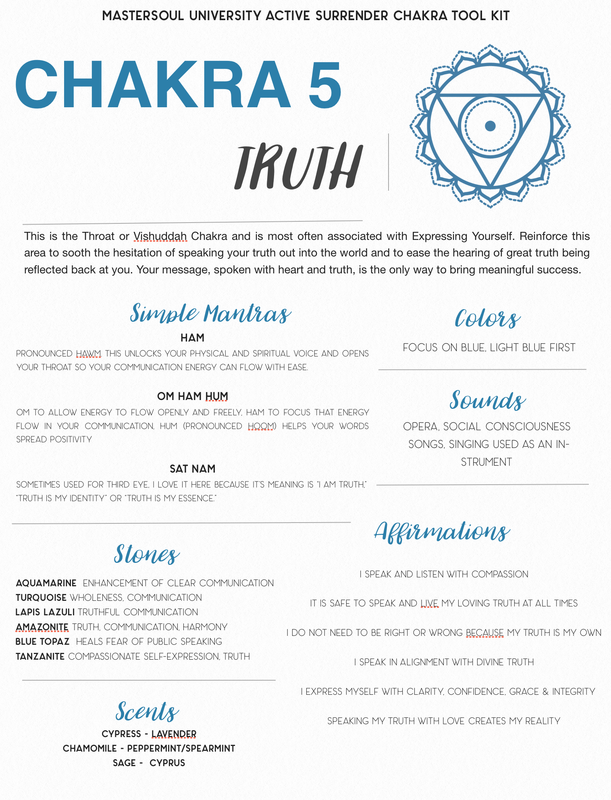 CLASS 6 - TRUTH... Chakra Five is our throat and communication area which is why vulnerability of your expression of highest self is supported in the surrender process. To be able to allow your vulnerabilities exist without the stories attached then you can express with love. To surrender to our truth in both being and expression, we need to be aware of what holds us hostage in the past or future. Recognize these stories for what they are. Feel them. Acknowledge them. Release the judgement around them. ​And then get truly present to see what is true in THIS moment. ​Use these journal prompts to spur the remembering. What is your history about speaking up? What are the stories running through your head? What truths do you speak that are yours and which ones were planted there by others? Remember a time in your life when you spoke YOUR truth and others agreed with or praised you. Remember a time in your life when you spoke YOUR truth and others disagreed with or got angry at you. Remember a time in your life where it felt completely safe to speak your truth. Remember a time in your life where it felt completely UNsafe to speak your truth. Who told you this was true? Who told you this was untrue? Remember a time in your life when you spoke about something but it wasn't really what you believed. Remember telling a lie and it felt good. Remember telling a lie and it felt bad. Remember a time when you were silent but really wanted to say something. Remember a time when you spoke up but didn't really want to. Remember a time in your life when you talked about a dream and were told it was unrealistic, untrue, undesirable, etc. Remember a time when you talked about a dream and were told it was possible. Remember a time when you felt ashamed for talking. Remember a time when you were silenced. Remember a time when you silenced someone else. Remember a time when you felt amazing for talking. Remember a time when you were encouraged to talk. Remember a time when you encouraged someone else to talk. Remember a time when you couldn't shut up. Remember a time when someone else around you wouldn't shut up. Remember a time when you were told you were too loud. Or too quiet. Remember a time when you someone else was too loud. Or too quiet. Remember when someone else's truth hurt you. Remember when someone else's truth inspired you. Imagine your voice is speaking out on a global stage inspiring others. Go deep into the vision and details and feel your attachment to that visibility and success. Imagine that you stay scared and never say anything. What does your life look like? Imagine you wrote a book about your darkest secrets. What would they be and who would be hurt by them? Who would be inspired by them? Feel into your attachment to that hurt. Imagine you wrote a book about your darkest secrets. What would they be and who would be inspired by them? Feel into your attachment to that inspiration. Imagine that your family and friends hear you talking about things they wouldn't agree with. Go deep into the vision and details and feel your attachment to the emotion it brings up. Imagine that your life changed because you spoke about something that you've been holding on to. What is that truth and what would it feel like to unburden yourself of it? Imagine that because you spoke up, the world changed. What would you fundamentally shift and how does it feel to know you're responsible for it? Write about it and how attached you truly feel to it being real. Imagine your death bed reflection. What are the truths you're most afraid of never having spoken. Feel into your emotional attachment to that. Imagine your death bed reflection. What are the truths you're most proud of speaking. Feel into your emotional attachment to that. Get centered and get fully present in this moment. You can use this quick 5 minute meditation below to help you come back to NOW and then ask yourself: WHAT DO I WANT TO SPEAK OUT LOUD IN THIS MOMENT? and CAN I BE BRAVE ENOUGH RIGHT NOW TO SAY IT?